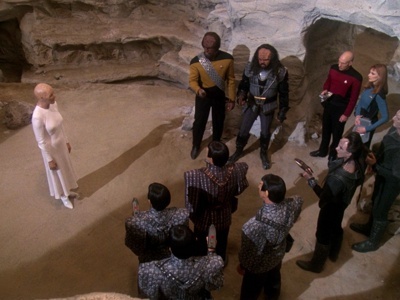 Stardate: 46731.5 - Picard's old archaeology professor is found murdered, the crew try to complete his research. Soon, the crew must compete with Romulans and Klingons and Cardassians to uncover the truth behind his discoveries. Tigh and Number Six take their first glimpse at their unborn child, Tyrol offers Adama Cylon technology in return for his fellow Cylons properly reintegrated into the fleet, and an attempted coup leads to a costly struggle to maintain civility. Following Amanda's public revelation that their daughter was responsible for the MAGLEV tragedy, the Graystones must face the wrath of angry Capricans.